What to do with fresh turmeric root? Why turn it into this SUPER FOOD medley! 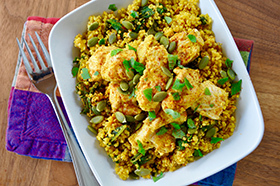 The fresh turmeric is extremely easy to incorporate into the dish and is used in both the marinade for the chicken and in the quinoa. Note: for those on a super low carb diet, feel free to sub in 4 cups of shredded cauliflower or Brussels sprouts in place of the quinoa. Reduce the broth to 1/4 cup and reduce the cook time in half. Combine all of the marinade ingredients in a bowl, except for the chicken. Mix well to combine. Add the chicken cubes and mix well. Cover and place in the fridge for 2 hours, or up to overnight. Preheat the oven to 360 degrees F. Lightly coat a baking sheet with olive oil. Place the chicken cubes on the pan so that they aren’t touching. Bake for 20 minutes. Without removing the chicken from the oven switch to the high broil for 5 to 10 minutes. Remove once golden. In a medium sauce pan place the coconut oil over medium heat. Add the turmeric, curry and cumin. Heat until fragrant. Add the quinoa and stir frequently until it starts to make popping sounds. Add the chicken broth and bring to a low simmer. Cover, reduce the heat to low, and cook undisturbed for 10 minutes. Remove the lid, stir in the kale, and place the lid back, cooking for another undisturbed 10 minutes. Turn the heat off and let the quinoa sit for 5 minutes. Remove the lid and transfer to a bowl. Fluff the quinoa and mix in the lemon juice. Garnish with pepitas and serve with the chicken. Enjoy! One serving equals: 330 calories, 21g fat, 21g carbohydrate, 300mg sodium, 1g sugar, 4g fiber, and 15g protein. Copyright 2018 RESHAPE. All rights reserved. This website is for informational and entertainment purposes only and is not a substitute for medical advice, diagnosis, or treatment.